'Tis the season... to try my hand at crafting felt guinea pig ornaments. Naturally, they couldn't be generic ones - I had to try making custom ornaments in each pig's likeness. I thought Revy would be the easiest to start out with, but sketching the patterns in her fur took longer than expected. That pig has some crazy markings going on. As a result, initial attempts had Revy resembling a cross between a stegosaurus and a porcupine. Drawing is not my strong suit. Above is the finished ornament, which may or may not bear a passing resemblance to Revy. One wheeker down, five more to go. 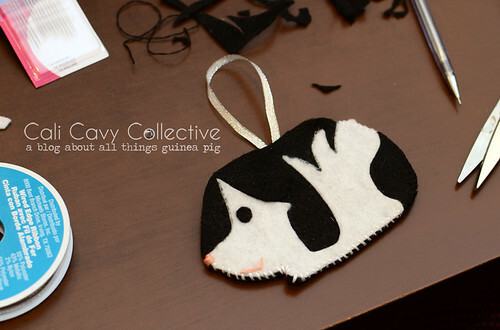 Coming soon: a craft tutorial on how to make your own felt guinea pig ornaments! Yes of course! I actually sewed on a little flap for the ears, although it's difficult to see in the photo because I made it in black (to match the real-life Revy's ears). But, the piggy ears are definitely there - and they're movable! What do you mean - you can't draw? It's perfect! I was wondering if there might be a way to attach a piggy ear to make it kind of three-dimensional. Ears are my favorite piggy feature. I recognized Revy immediately! I can't wait to see the rest. Very cute.